Again, on the close-up, I notice the eyes could be better, but when looking at these figures at a normal distance, one never notices such small details. Overal I’m happy with the final result. 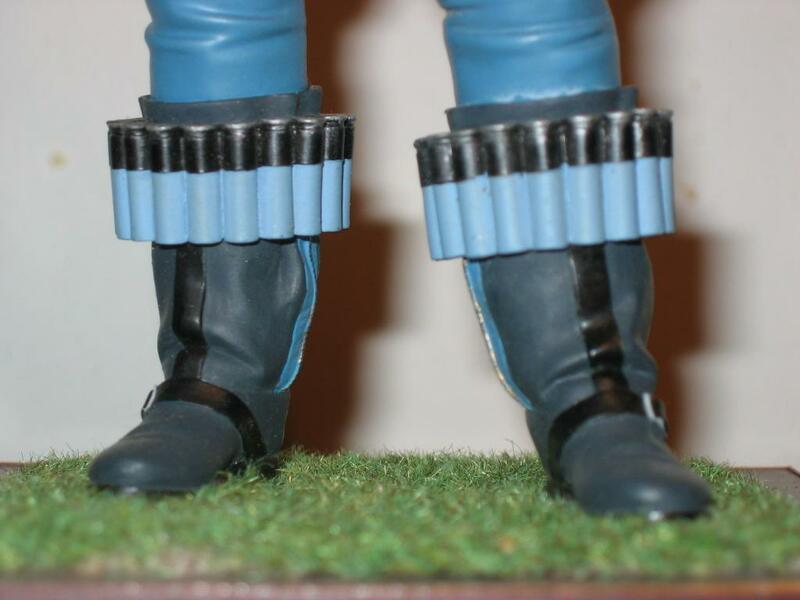 Detail on the boots and the flares (unless it’s something else, but I don’t think he carried a gunshot on his Messerschmitt 🙂 Even thought the legend says that he would smoke his cigar while on mission, and that he even had a cigarette lighter installed on his aircraft! Not sure about the credibility of this!) . Had to laugh about the boots. I imagined the flares going off after clicking his boots together in ‘attention’. He sure looks like a maverick. It takes a maverick to achieve more than the rules limit. He was not the top German Fighter pilot Ace (others scored way more kills than he did), but he was somehow a pioneer, as he created new tactics for the dog fights versus the Spitfires and other allied aircraft of that period, almost like a Red Baron from WWII. He taught others about those new tactics on how to win those dogfights, and his tactics were even taught to future fighter pilots in Germany during the war. He survived the war and traveled around making conferences and stuff like that. 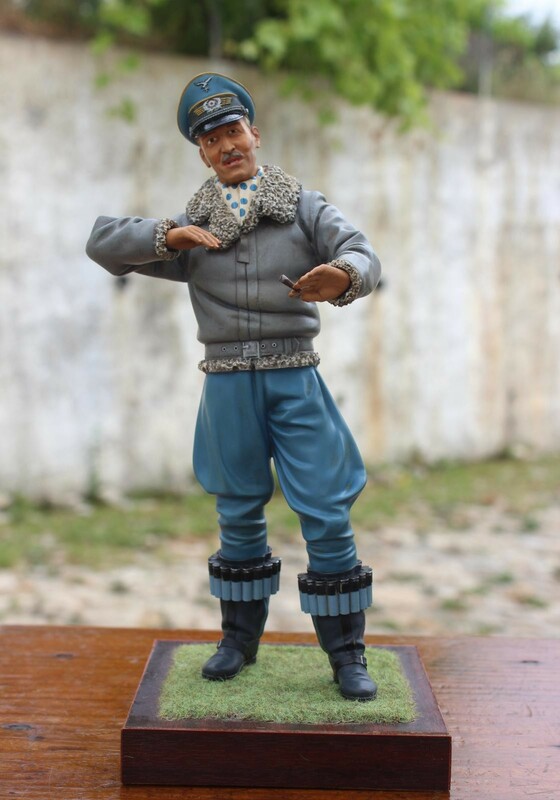 A wonderful figure that captures his expression while explaining a dogfight. 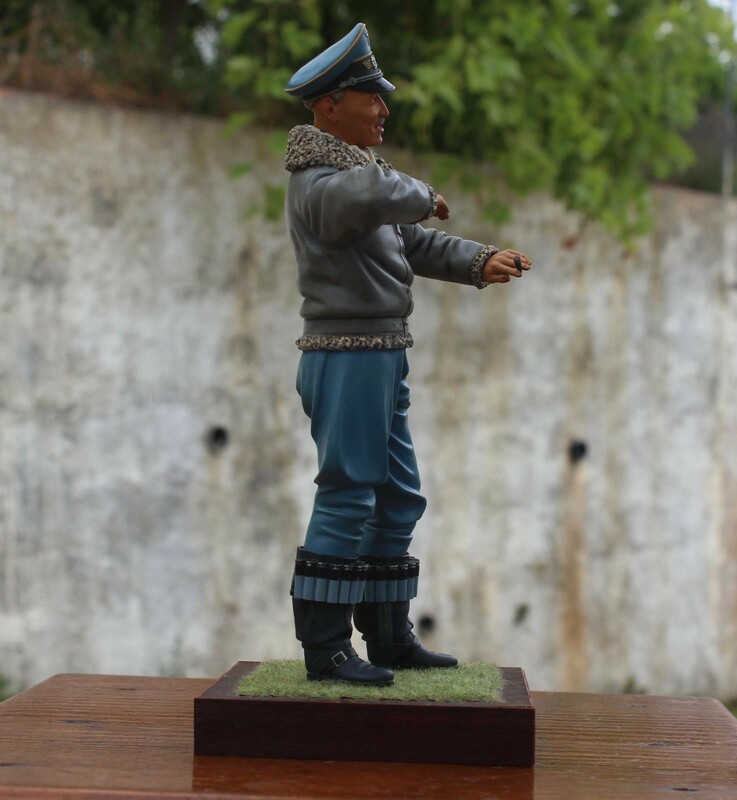 General Galland was truly a towering figure among generations of fighter pilots. 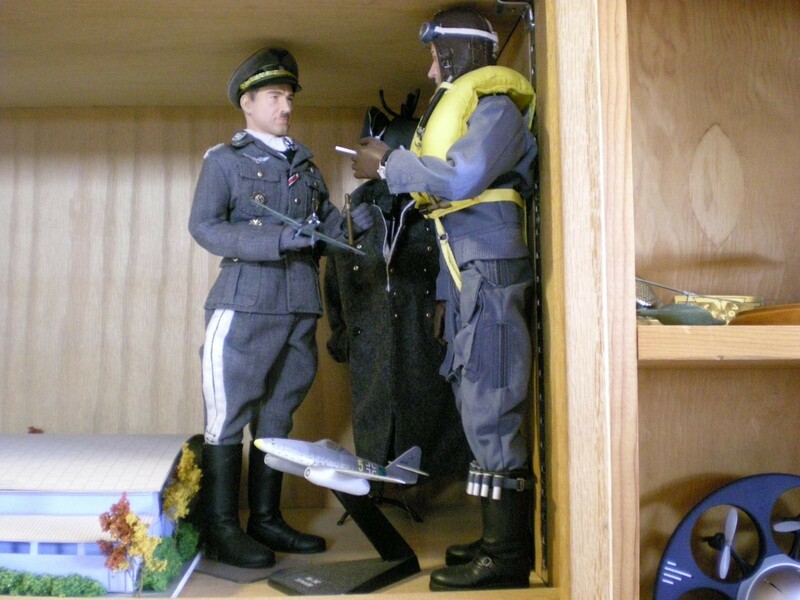 Here is a 1/6 scale scene with Colonel Galland discussing the merits of the Bf-109 with one of his squadron’s pilots . Thanks for the compliment, and for the added pics! It seems that flying the Messerschmitt Bf-109 was not the easiest thing to do. Not to mention that it was a small fighter, compared to others, both Allied and other German fighters, and with a rather tight cockpit. Apparently it also had some issues whith fragile landing gears (it seems that inexperienced pilots would tend to lend on the nose) . The debate stills exists today, as which one was a better fighter, the Bf-109E or the Spitfire V (both used during the Battle of Britain, and for some time on the Western Front) . There are arguments for both sides, speed, manoeuvrability, etc. I know that I don’t dislike the Spitfire, but I’ve always loved the Bf-109 better. As a matter fact it’s my personal favorite fighter from the WWII, all theatres included. Have a few still on the original boxes, for some time in the future. Most of them on 1/72. One, a ME109E, on 1/32, a Hasegawa model. I’ve done some work on this one many years ago, the engine is ready, the cockpit is almost ready (but it has a lot of scratch-building, for as much realism as possible, as the scale allows it, months of research on books and pictures…), and I want to make the exact aircraft flown by Leutnant Werner Schroer (he ended up being a Major, with 114 victories) while on 2 / JG 27, in Northern Africa/ME (Egypt if not mistaken) . The sources I have on books don’t seem to fully agree if his aircraft at the time was a Bf-109E-7/Trop, or a BF-109F-4/N Trop. Anyway, the kit doesn’t come with the decals for this particular aircraft, which is one of the reasons I had to put it aside for a while. Maybe I’ll end up painting the famous black with red contour “8” he used, I guess the scale will allow it. After Douglas Bader’s capture, Galland took him to the airfield and let him sit in a 109 cockpit. His thought was “gawd, what an awful place to die.” Considering the Spitfire’s confines, coming from a Spitfire pilot, that’s saying something. After being around both aircraft, I cannot see much difference in the overall arrangements. However, the instruments were a different matter. Brits were all over the map with their instruments. It was like, “and by the way old chap, throw an altimeter and airspeed in there someplace will you?” On the other hand, Germans, being what they are, had everything in precise logical arrangement. Another tick on the Spitfire’s hide was its systems. Since their wasn’t enough time to train pilots in the delicate vagaries of systems like propeller ~ ahem ~ airscrew pitch control, mixture control and cooling flaps, the Brits automated everything, but being British, they used pneumatic systems! These air bottles are still being fiddled with. Working on the Spit is like working on a leaky pipe organ. I know, I’ve had the displeasure. American fighters were a whole different can of prop wash, with cockpits big enough to run runaround and manually controlled, hydraulically actuated systems. Take a Spit and a 109 and put it next to a P-51 or P-47 and the euro fighters of that day look positively delicate. The old saying from Grumman pilots was was you could fly a Grumman through a brick wall and come out the other side unscathed. Never tried the brick wall but I have flown through numerous “telephone” (actually power) wires and come through unscathed. British bikes were much the same, at least from an operating standpoint, with their finicky natures, “tickled” carbs, “special” Wentworth wrenches and infamous Lucas electrics. 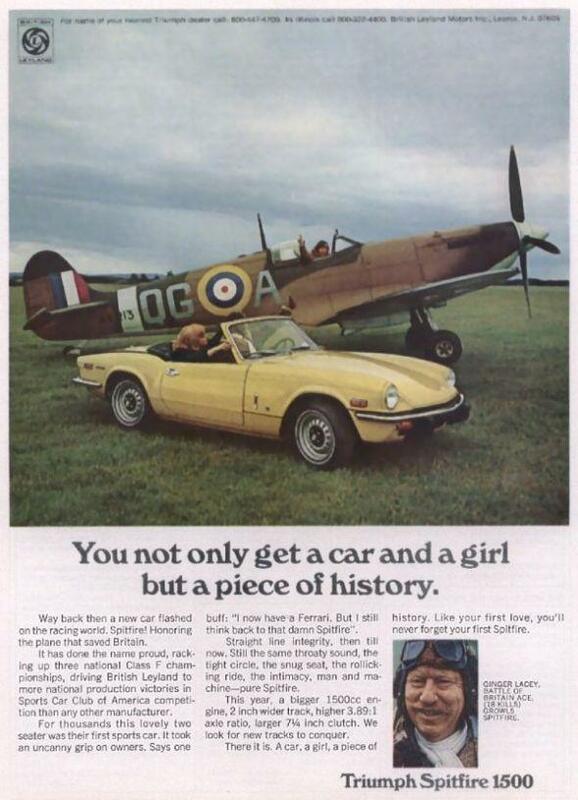 My ’73 Triumph Spitfire was truly a bizarre creature whose mechanics I often could not fathom. It had one of those early emission control recovery systems that robbed power and was more trouble than it was worth. Since it was a simple system, or so I thought, I decided to remove it. But no matter what I did, no matter what holes I plugged or carb adjustments I made, the Spit, would not run. I finally had to reinstall the EC system and live with it. Wouldn’t’ you know it – British pneumatics. Then there was the horn button. Until the the Triumph, I never realized what a punch 12V could pack. If my arm was on the chrome door strip when I punched the horn, it would punch me bank with electroshock therapy. I never did find the faulty connection. Oddly, I later flew a beech with a radio button on the control wheel that had the very same effect when it rained. Owned one, worked on both. I actually did get the girl with it. Thanks a lot for your reply and your 1st hand testimony on these two famous WWII aircraft. Yes, indeed, I didn’t even compare the Messerschmitt Bf-109 with American fighters from the same time period, especially the P-47 Thunderbolt! Another outstanding work! I think the flares are a primitive way of ejecting from the aircraft, you’d click your heels and away you go.. 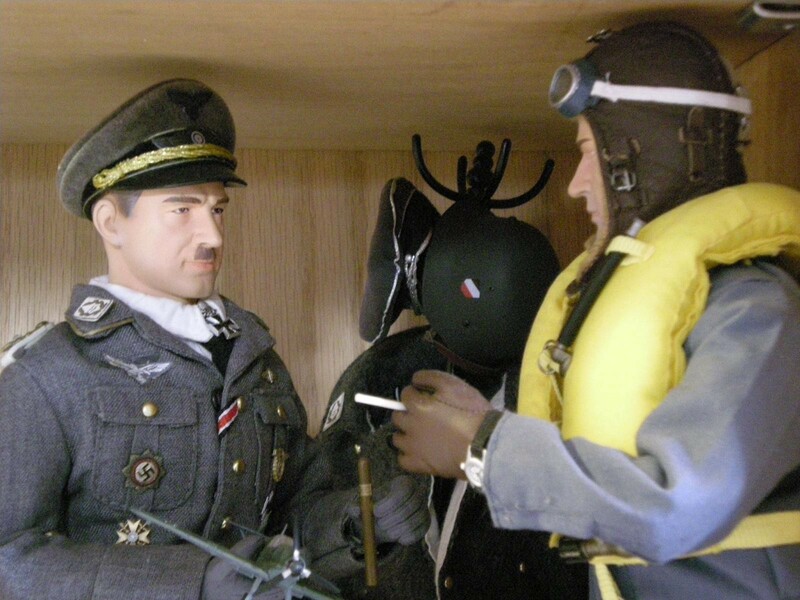 He did have a cigar lighter installed in his airplanes. I asked him back in 1984 and he confirmed yes (by then he couldn’t have any cigars and only one glass of red wine per day – a considerable comedown from 40 years earlier). That’s a very realistic-looking figure. Wow! You met the man in person! Amazing! And you confirm the story about him having a cigar lighter installed in his airplanes! Thank you very much, it’s great to have a 1st hand confirmation! Believe he passed in 96, at the age of 84 years old. 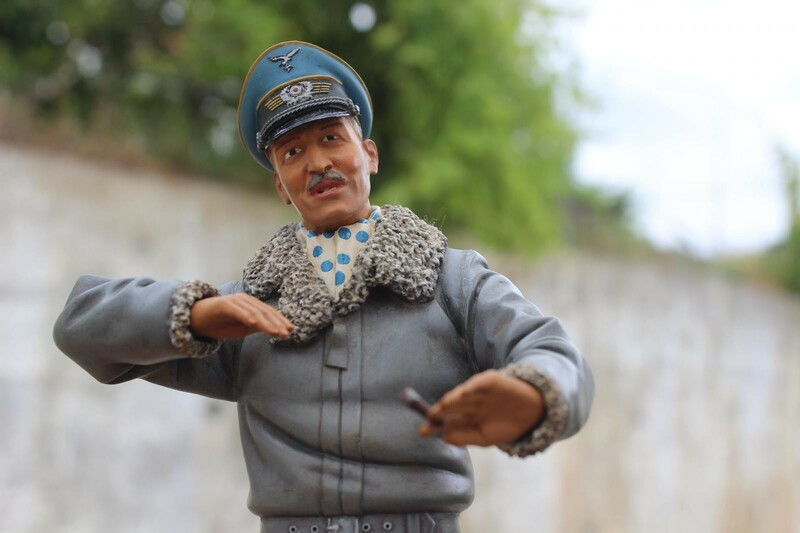 Quite the collection of figures here, sir….I love them! 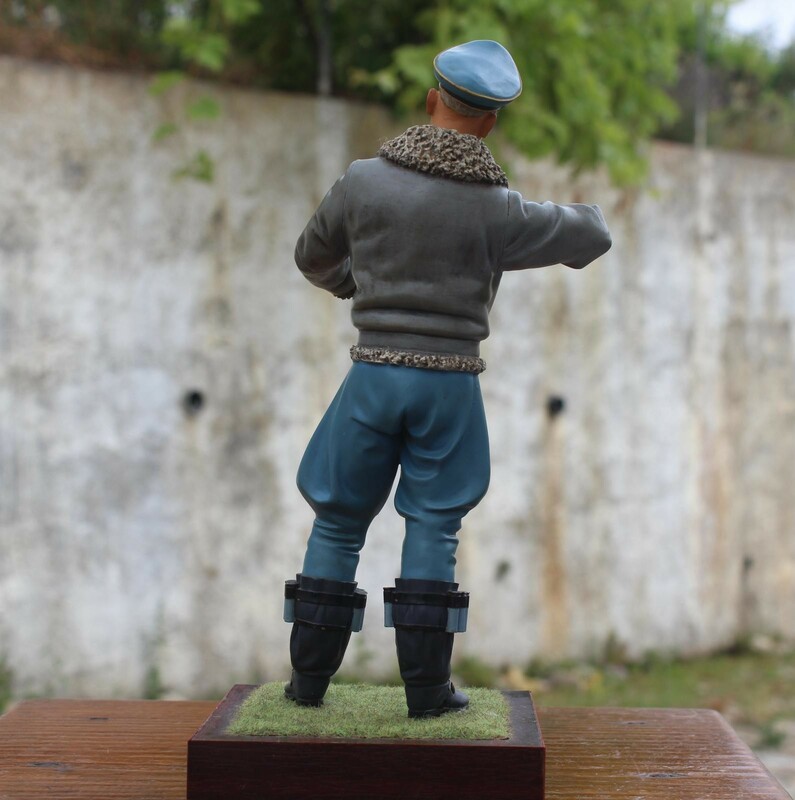 Very nice collection of figures! 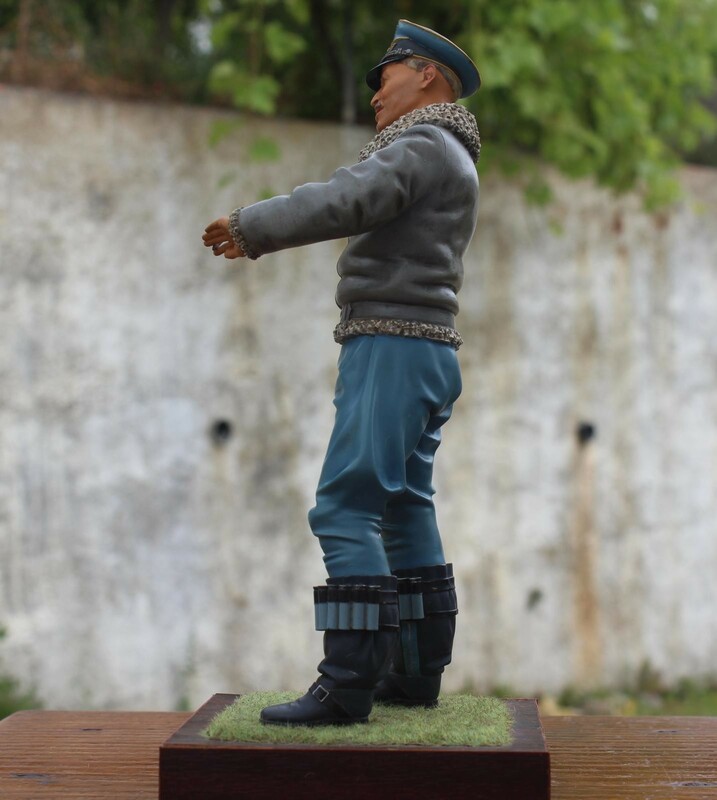 Glad you found it now (there are 3 more figures I posted here, including one you’ll certainly recognize 🙂 under Figures, but those are 120mm scale, while this one is a 200mm scale, the larger one I’ve ever painted). Figures, and especially busts, are very interesting subjects IMO. And there are some really amazing works of art being sculpted, and also some fantastic artists painting them. Not in enamels, as I did with Galland and the other figures I painted decades ago, but either in acrylics, or oils. I’m now learning oil techniques, so I’ll be able to try some art work one of these days, hopefully soon.